Scene 1: Three high school students are introduced: Justin, a varsity athlete very concerned with staying healthy; Jessica, an overachiever committed to getting into an excellent college; and David, a bit of a party animal (but one who draws the line at “serious” drugs like cocaine and meth). Despite their differences, these students all have one thing in common…an addiction to prescription drugs. 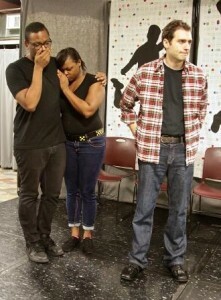 Scene 2 – Justin’s Story: While Justin seems like a “normal guy”, he suffers from social anxiety. When he is injured playing soccer, he must undergo surgery and is prescribed pain meds. He soon realizes that not only does his medication numb the pain, but it relieves his anxiety as well. When his prescription runs out, he lies to his doctor about his pain in order to get more. Justin eventually realizes that the drugs are having a negative impact not only on his performance at school, but his body as well. He attempts to quit, but the withdrawal symptoms are too much for him and he turns back to the drugs. He begins stealing both drugs and money to buy more. He is cut from the soccer team, fired from his job, begins failing his classes, and becomes estranged from family and friends. While Justin recognizes that the drugs are destroying his life, he is still unable to quit using. He finally admits that he needs help in order to deal with his addiction. Scene 3 – Jessica’s Story: Jessica is a high achiever with great grades, a great job, and great relationships. Things start to fall apart for her when her boyfriend breaks up with her and she has trouble focusing on her schoolwork because of how upset she is. Her friend convinces her that taking some Adderall in order to get everything accomplished is a good idea. Jessica realizes that the pills not only help her stay focused, but help her ignore her problems as well. She convinces her doctor that she needs a prescription and soon becomes addicted. She eventually realizes that her schoolwork and her relationships are suffering and that she is not acting like herself. When she repeatedly tries to quit, though, she suffers from withdrawal symptoms and depression. She finally admits that she cannot do it on her own. Scene 4 – David’s Story: David readily admits to supplying friends with drugs, but convinces himself that it’s okay because he does his research and sticks to legal drugs. He supplies not only Justin and Jessica with prescription drugs, but their mutual friend Kyle as well. Unbeknownst to David, Kyle combines the prescription drugs with large quantities of alcohol. Kyle overdoses after a party at David’s house and dies. In order to cope with his guilt, David begins using more and more. He is desperate to make more money to support his habit and pushes his friends to buy more drugs from him. When he later runs into Justin and Jessica, he learns that they have both been in rehab. They try to convince him that he needs help as well, but it’s not until he gets in trouble with the law that David admits that he, too, has a problem. Scene 5: Justin, Jessica, and David describe their shared experience of first denying their addictions, then unsuccessfully attempting to break their habits before finally realizing that they needed to seek help in order to truly recover. They are all currently in the midst of recovery and finally have hope that they can actually succeed.